Aga Khan Music Awards | Ismaili.NET - Heritage F.I.E.L.D. Aga Khan Music Initiative is an interregional music and arts education programme with worldwide performance, outreach, mentoring, and artistic production activities. The Initiative was launched by His Highness the Aga Khan to support talented musicians and music educators working to preserve, transmit, and further develop their musical heritage in contemporary forms. The Initiative designs and implements a country-specific set of activities for each country into which it invests, and works to promote revitalization of cultural heritage both as a source of livelihood for musicians and as a means to strengthen pluralism in nations where it is challenged by social, political, and economic constraints. Through its work, the Initiative strives to support exceptional artistic talent; promote the revival of historical connections among artists from Central Asia, South Asia, the Middle East and North Africa by organizing creative collaborations among artistic communities from these regions; and disseminate results of this work through a global network of partnerships with educational institutions, arts presenters, and music distributors. To this end, musicians in the Music Initiative’s artist roster participate in diverse kinds of performances that range from concerts of traditional repertory to contemporary expressions of tradition-based art to interregional collaborations that feature talented artists from different countries in the Music Initiative’s regions of activity. Education is at the centre of the Music Initiative’s work. The Initiative focuses on developing and testing newly created teaching and learning methodologies, setting up teacher-training mechanisms, operating talent-support centres, and presenting performance and artist-in-residence programmes that provide students an opportunity to experience the creative challenges of intercultural music-making. Residencies and workshops featuring musicians from the Music Initiative’s artist roster have been presented at many academic and cultural institutions throughout North America and Europe. The Music Initiative is a programme of the Aga Khan Trust for Culture. The Trust, in turn, serves as the cultural development agency of the Aga Khan Development Network, one of the world’s largest private development networks, and the only one that prioritizes cultural development on a par with economic and social development in all of its projects and commitments. Through an integrated multi-sector approach to cultural development, the Music Initiative mobilizes the resources of the AKDN to support vibrant interlinked artistic communities devoted to creating new music rooted in but not constrained by tradition while also building audiences for such music through arts education on a mass scale. Like other programmes of the Trust for Culture, the Music Initiative plays an active operational role in all the projects and activities into which it invests, and does not administer a grants programme for either individuals or institutions. The Aga Khan Development Network in Geneva, Switzerland, has announced the establishment of the Aga Khan Music Awards. The triennial awards, which include $500,000 in prizes, will recognize exceptional creativity, promise, and enterprise in music performance, creation, education, preservation, and revitalization in societies in which Muslims have a significant presence. Award winners will be invited to pursue professional development opportunities arranged in collaboration with AKDN, including commissions for the creation of new works, contracts for recordings and artist management, support for pilot education initiatives, and technical or curatorial consultancies for music archiving, preservation, and dissemination projects. The awards will be governed by a steering committee co-chaired by the Aga Khan and his brother Prince Amyn Aga Khan, and will be administered by the Aga Khan Music Initiative. Nominations for the awards will be solicited from a group of one hundred music specialists around the world. The first awards ceremony is scheduled to take place in Lisbon, Portugal, in late March 2019 and will be co-hosted by the Calouste Gulbenkian Foundation and the Lisbon Municipality. 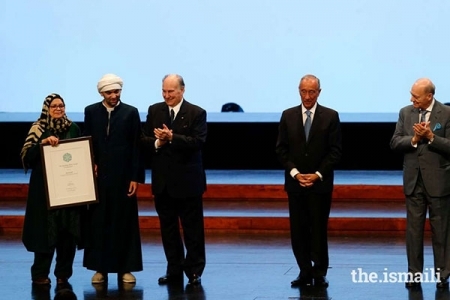 "The Aga Khan Music Awards will aspire to fill a unique cultural role," said His Highness the Aga Khan, the spiritual leader of the Shia Imami Ismaili Muslims. "Among the world's many music awards, none of the current awards or prizes focus on the constellation of devotional music and poetry, of indigenous classical music, traditional folk music, and tradition-inspired contemporary music that has flourished in cultures shaped by Islam."